The spectacular Alhambra and more in Granada, Spain. Beyond the bustle of Barcelona, far from the madness of Madrid but close to the orange-laden trees of Seville lies one of Spain’s most charming cities. Nestled at the foot of the Sierra Nevada mountain range in the Andalusian region, Granada embodies an unlikely confluence of history. A region traversed by the ancient Phoenicians, Greeks, Carthaginians and Romans, it was invaded and inhabited by the Moors – who named it Al-Andalus – in the 8th century AD. The awe-inspiring UNESCO World Heritage Site of Alhambra, perched high above the city, with red stone walls that rival the crimson hues of the Andalusian sunset, is proof of its Moorish history. Once home to Arabs, Jews, Berbers and Christians, the city’s diverse past spills over into its present in the form of cathedrals and Christian monuments that co-exist with Islamic structures like the little known Arab baths. Marked by quaint tapas bars as well as bazaars and a Moroccan spice market, Granada comes alive during the festival of Corpus Christi in the month of June. 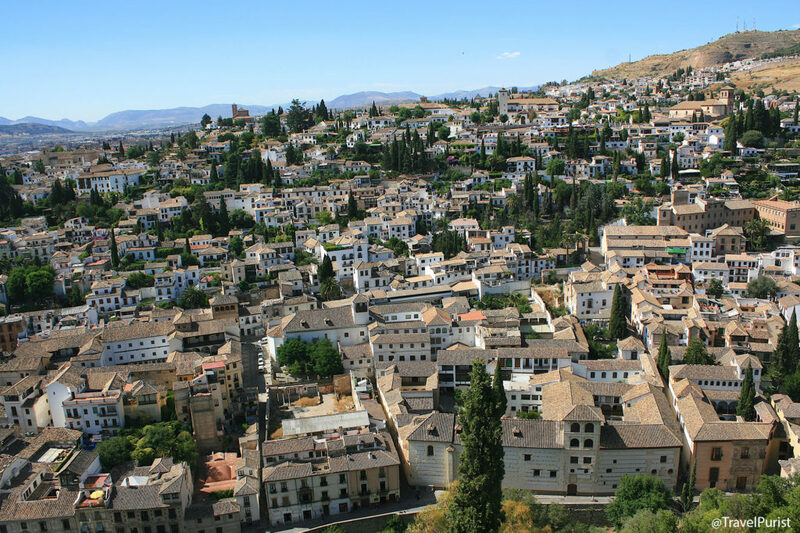 Granada is home to Spain’s most well-preserved Arab quarter – the Albaicín – and also to intriguing gypsy cave dwellings (some of these double up as bars) in the quaint gypsy quarter of Sacromonte. The Albaicín is marked by Islamic architecture and walls remaining from the Nasrid dynasty, together with evidence of the Reconquista or the Christian reconquest. You could get lost in its labyrinthine maze of narrow streets lined with traditional houses; but complicated as it is to navigate the quarter, it’s comforting to know that all lanes lead up to the Plaza de San Nicolas with its stunning view of the Alhambra and surrounding mountainscape. In Sacromonte, the marginalised Roma community or the gypsies (called Los Gitanos in Spanish) carved living spaces for themselves in the form of caves, to form a unique settlement in the mountainside, in the 16th century. Unlike the tangled Albaicín, Sacromonte comprises just one stretch but locals will ask you to be careful with your wallet here. Stop by at one of the cave-restaurants or bars for a Flamenco show along with tapas or to sample the unique Sacromonte cuisine. Flamenco shows in both Albaicín and Sacromonte are more authentic and nuanced given the history of the quarters. Zambra is a type of Flamenco unique to the Andalusian gypsies. In Albaicín, the open-air restaurant Jardines de Zoraya is also known for its performances (but account for time spent in finding the place) and excellent tapas. The Sacromonte omelette, garlic soup, broad bean preparations, Iberico ham and the Remojon orange and cod salad are among the local delicacies to be sampled in Granada. Visit Bodegas Castaneda, located at the edge of Albaicín at Plaza Nueva, if only for its old world ambience (complete with unabashed displays of meat), and La Higuera in the Albaicín for its tapas. Away from the quarters, in the artsy (and more Christian) district of El Realejo is the crowded Los Diamantes, known for its seafood. Both, the Albaicín and Sacromonte, call for a leisurely stroll with long halts at tapas bars along the way. But then, all of Granada calls for that; it is most definitely a city for walking. 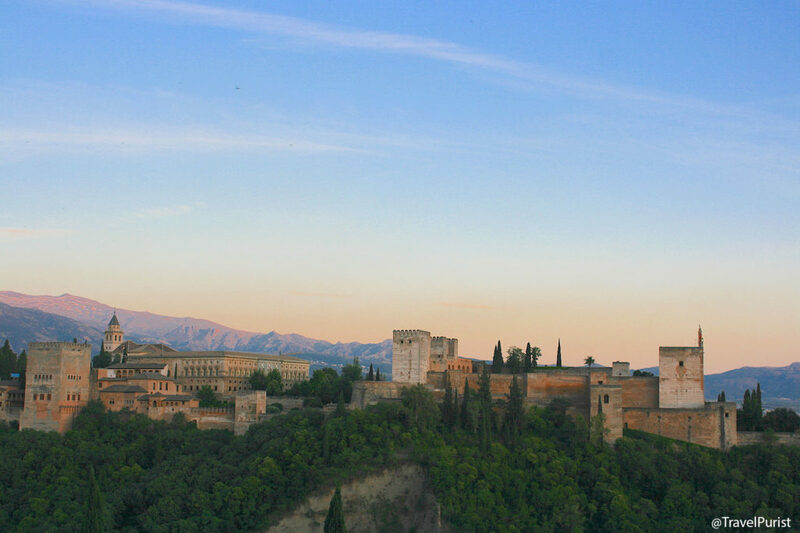 Granada’s main attraction, undoubtedly, is the spectacular fortress that looms over the city – the Alhambra. Voted one of the new seven wonders of the world, the palace complex dates back to the 13th century when it was built over a smaller 9th century fortress (that was, in turn, built over Roman fortifications) by the Andalusi Sultan Muhammad ben al-Hamar of the Emirate of Granada. Called the al-kalat al-Hamra – the castle made of red earth – by the locals, it soon came to be called the Alhambra. The monument is divided into four parts – the Palaces, the Alcazaba or military area, the Medina or citadel and the Generalife or market garden area – with architectural features such as Arabic inscriptions and geometric motifs as well as colourful tile mosaics that are reminiscent of Islamic architecture found across the Middle East, Iran and India. A prominent feature are its gardens and fountains, framed by beautiful column arcades. The Alhambra was the residence of the Moorish Sultans, members of their court and their army, mainly during the decline of the Nasrid dynasty. After the Christian Reconquista in 1492, when it became the court of King Ferdinand and Queen Isabella, the monument was embellished with Renaissance elements. The Alhambra was where Christopher Columbus received the royal grant for his voyage into the New World. Located at the foot of Alhambra and close to Plaza Nueva, the 11th century Arab Baths called El Bañuelo, see few visitors. A world away from the crowds of tourists at the fortress, the baths were once part of a mosque that stood on the location. Although their brick walls are stripped bare today, the baths retain a glimmer of their former glory in the form of decorative embellishments and beautiful star-shaped windows that serve as stencils to the sunlight that streams through them, lighting up the 1000-year old floor with starry patterns. The baths survived the destruction of Islamic structures by Granada’s Catholic rulers thanks to the construction of a private house on the site. 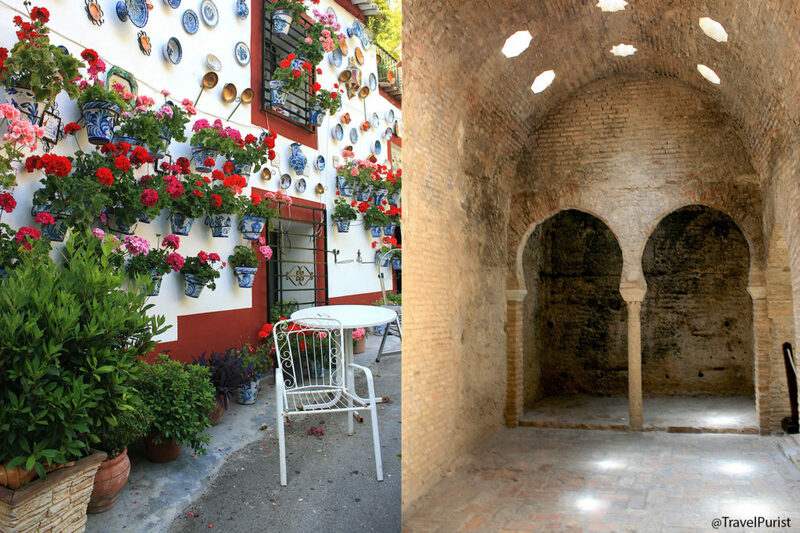 Located at Carrera del Darro 31, these are the best preserved Arab baths in Spain. As if its Christian and Islamic influences weren’t enough, Granada also celebrates its pagan traditions. 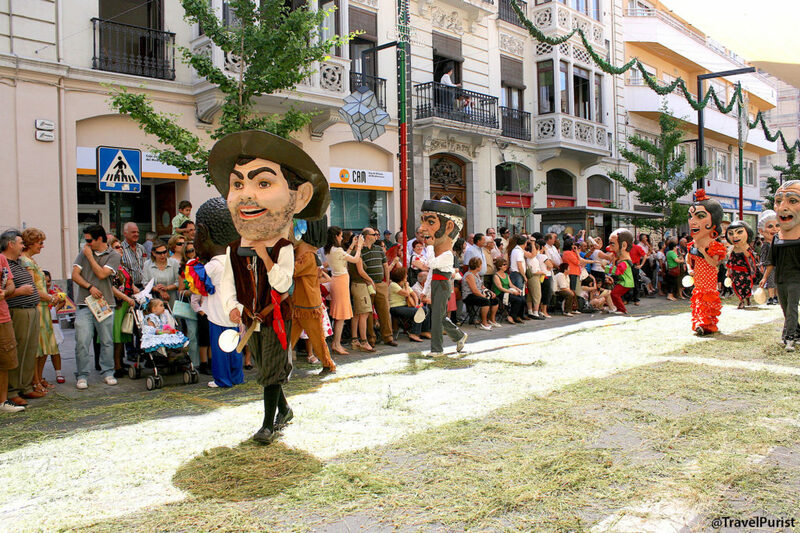 The Christian festival of Corpus Christi, celebrated in June each year, opens with the Tarasca that is of pagan origin. Led by a larger-than-life female figure on a dragon to symbolize the legend of the tarasque in which a fearful monster resembling a dragon is tamed by a woman, the procession comprises characters in costumes wearing giant heads and masks. 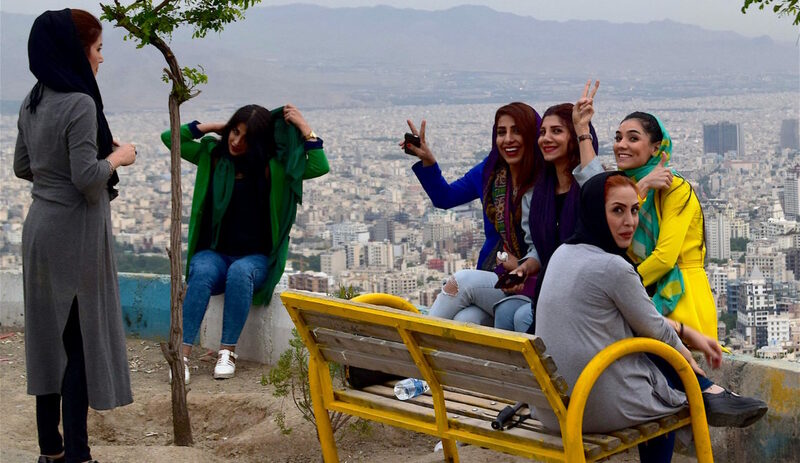 There is much merriment and buffoonery as bystanders are playfully knocked on the head by members of the procession who stop by to interact with the crowds eager for photo opportunities. The dress worn by the mannequin standing atop the dragon too is a much-awaited secret that is revealed at the start of the procession. Corpus Christi is Granada’s most important religious feast and was an attempt by the Catholic kings to Christianise their subjects; the Tarasca is believed to have been added later. 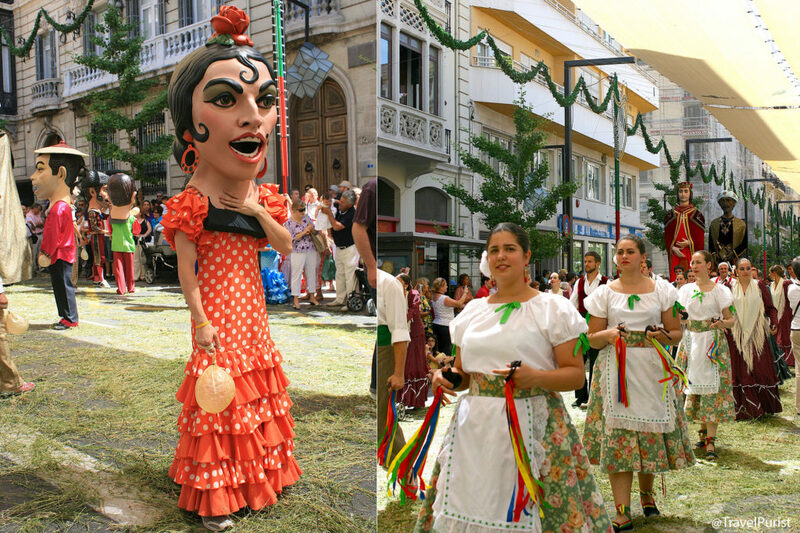 The festival is marked by a number of events including bullfights, Flamenco performances and political cartoon competitions. 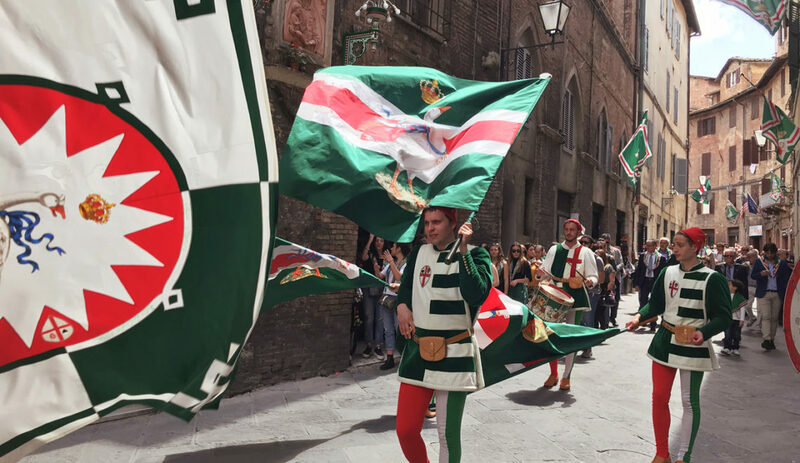 A week-long celebration held around mid-June (the date falls 60 days after Easter Monday), it is accompanied by a fair or ‘feria’ that includes folk performances, nightlife, pony rides, firework displays and local food. The city is at its festive best during this time and all work comes to a standstill. All you need to do is head out to the city centre and revel in the holiday spirit. 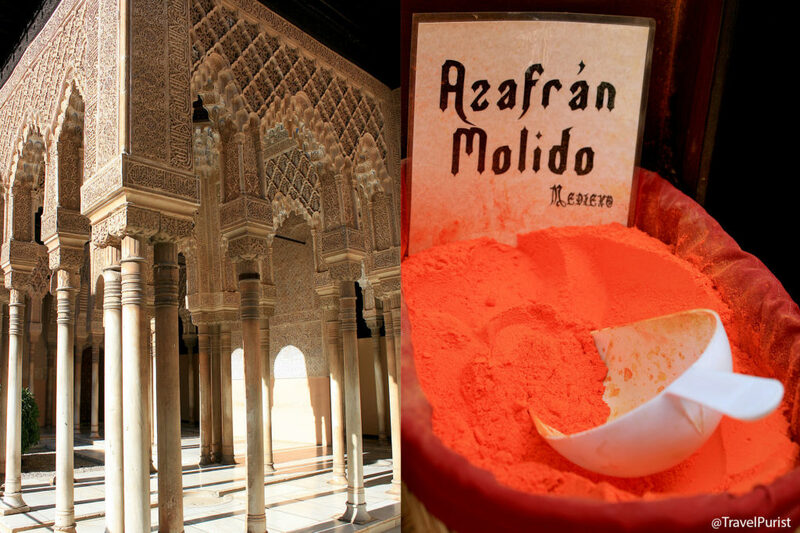 Visit: The Alhambra (but of course), the Arab baths (El Bañuelo), the Cathedral (Catedral de Granada), the Royal Chapel (Capilla Real), the Archaeological Museum (Museo Arqueológico), the Moroccan Spice Market (Alcaiceria). Stay: Casa Carmen de Toqueros. This charming little hotel with a view of the Alhambra is a 14th century heritage structure and an Albaicín gem. Get around: It is easy to get around Granada on foot and highly recommended but make sure you carry a sun hat and wear comfortable shoes. Divide the city into three regions and cover a different one every day. 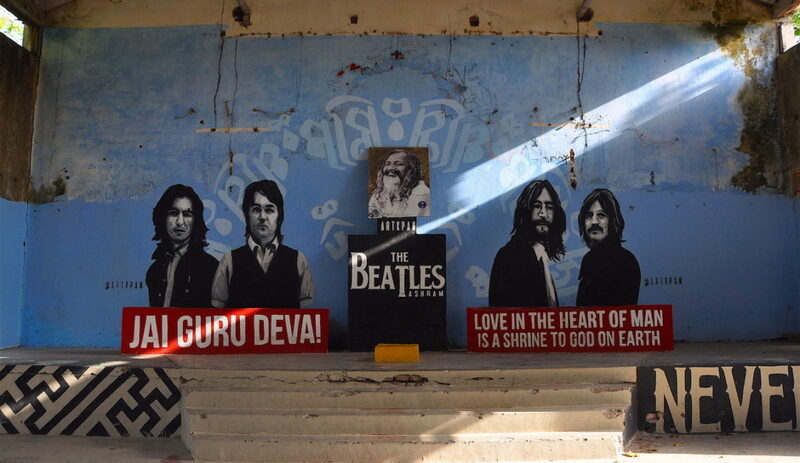 Be ready for a steep climb through the Arab and gypsy quarters.